Alfred Schnittke, once the record industry’s best-loved enfant terrible, has fallen from favor among recording artists in recent years. In the 1980s and 90s, he was one of the most recorded living composers, and notched up well over 100 commercial CDs by the time of his death in 1998. But, as is often the case, his status as a recently deceased composer has proved considerably less attractive, and while new recordings have continued to appear, their number in recent years has been significantly reduced. Artists coming to this music today face new challenges. Most of Schnittke’s music was written for specific musicians, who often played a significant role in the works’ composition, and who usually recorded the music written for them, more often than not to a standard that can easily be considered definitive. Fortunately for younger artists attracted to Schnittke’s works, there is always more than one way of interpreting them. Despite his often dense chromatic harmonies and his use of a range of Modernist techniques, Schnittke was at heart a romantic, and like the greatest composers of the 19th century, his music repays subjective interpretation, often seeming completely reinvented when presented in a new interpretive guise. That’s exactly what Quatour Molinari does here. The players are, no doubt, familiar with the existing recordings of these works (none of which have been deprived their fair share of commercial releases), but have chosen their own interpretive path. Schnittke wasn’t one for metronome marks or detailed performance directions, so there is plenty of scope here for alternative views. That’s not say that all interpretations are equally valid. In fact, one of the great advantages of the recordings made by Schnittke’s collaborators is that they document the approaches to the music that the composer endorsed. It often seems that the reason why so few performance directions are given is that Schnittke felt able to rely on the established performance traditions in which his collaborators worked. In the case of the chamber music, that was essentially the world of Shostakovich, a serious, impassioned, and emphatic kind of chamber music performance, with irony too, but of the darkest, most sardonic kind. 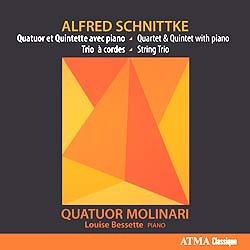 Quatour Molinari does some fascinating things with this music, but they don’t do that. The quartet approaches these three works as if they were religious minimalism, as if they were in the lighter, more ethereal style of Pärt or Knaifel. Tempos are slow, the louder stated dynamics are taken with a pinch of salt, and everything about the performances is designed to emphasize atmosphere over drama. The sound engineering is excellent, and that really helps to invoke this atmosphere. The playing is precise and cleanly articulated, which in combination with the excellent sound quality means that the counterpoint, especially in the Piano Quartet, comes through with greater clarity than in any previous recording I’ve heard. But much is lost in this approach. Many of the movements in the Trio and the Quintet rely on a sense of drama to articulate their form, with the music often gradually building in density and passion over the course of a few minutes. We rarely hear this effect from the Molinari players, who are at all times focused on the detail and the clarity of the localized textures. On the other hand, the three works are very different, and not all suffer to the same extent. The piano quartet was written in 1988 and was based on a short fragment left by the teenaged Gustav Mahler. This fragment was for the second movement of a projected Piano Quartet, the first movement of which was completed. Frustratingly, the Molinaris don’t include that first movement, despite there being plenty of space on the disc for it. Schnittke’s quartet was designed to follow this first movement, and the final statement of the fragment in his work has a sense of recapitulation when heard in this context, and that feeling of return is completely absent when the movement is heard alone. The main advantage of the Molinari’s approach to these three works, and particularly to the quartet, is that they take the edge off the dissonances. Schnittke uses a harmonic language which includes semitone clashes in almost every chord. Under heavier hands that can sound like continuous and unvaried dissonance. But it’s not, and the lighter touch that the Molinaris, plus pianist Louise Bessette, bring demonstrates that the harmonies here in fact considerably varied in their relative densities. There is also a passage where the piano plays the Mahler theme in minor 3rd clusters, and this is one of the few recordings to present the idea as a textural device involving the complex interplay of upper partials in the piano, rather than just aggressive dissonance. The piano trio was written in 1985 to commemorate the centenary of the birth of Alban Berg. Curiously though, a knowledge of the performance practices associated with Berg’s chamber music is little help here. Schnittke retains a Russian outlook throughout, even alluding at key points to Russian Orthodox chant. The players here seem all but unaware of these allusions, which are difficult to spot in their reading. As in the quartet, the emphasis is on a smooth legato and a delicacy of tone, which takes the edge off even the harshest dissonances, but runs the risk of turning what should be deeply impassioned music into little more than easy listening. The piano quintet is the most suitable of the three works for this kind of treatment. It too has moments of apoplexy and psychological crisis, but on the whole these are presented within a calm and sedate context. The piano is placed in an appropriately reverberant acoustic, giving its lines an ideal sense of atmosphere. And the string players follow suit, often taking their dynamics down to dangerously low extremes, while always retaining their tonal consistency. But too often, they remain at this low level when they should be building up to something more intense. Both the first movement and the second (In Tempo di Valse) rely on a gradual increase in intensity throughout their durations to make structural sense, but on both occasions this fails to materialize. In technical terms, everything about this recording is excellent. The balance between the players is finely judged. For some reason the strings almost wholly avoid vibrato, but this allows us to hear their remarkably high standard of intonation. The clarity and presence afforded by the sound engineering is the best I’ve heard on any recording of Schnittke’s chamber music. But too much is lacking. There is too little drama, passion, and intensity. It is as if the musicians are playing down these aspects to make the results more user-friendly. The results are certainly attractive, but the experience is incomplete. For a fuller picture, try the ever-impassioned, and just as atmospheric, Borodin Quartet for the piano quartet and piano quintet (Virgin Classics 791436), and the suitably aggressive—when required—Goevaerts recording of the string trio (Challenge 72375). This review appears in Fanfare Magazine, issue 36:6.